Happy March! The feet-numbing cold has made it clear that I’ve left Seattle and returned to my hometown of New York City. My weekend in Seattle might be over, but the memories remain. I had a fabulous time! I almost didn’t get there as I was flying standby with a buddy pass thanks to the flight attendant friend of my pal, Megan. Megan (who moved to Seattle with her boyfriend last fall) sent me a text on Wednesday evening letting me know the Thursday evening flight I hoped to take was overbooked and it was unlikely I would get on. I have never flown standby and am not the adventurous type when it comes to traveling. I like to have my seats confirmed and I typically arrive at the airport seriously early in case of long security lines. That’s the kind of person I am—which clashes with flying standby, but I was trying to save money. I freaked out—anxiety-related tears streaming down my face—especially after seeing that the cost of a regular flight with so little notice was way more expensive than I could afford. I even contemplated cancelling my trip. And then my hero swooped in—my friend (and ex-boyfriend) Jason used miles to purchase me a one-way ticket on Jet Blue. I even got an “even more room” seat. I decided to wing the return trip standby (which thankfully worked out). Crisis averted! Thank you, Jason. And thank you to Megan for getting me the standby tickets in the first place. You both saved me a lot of money! 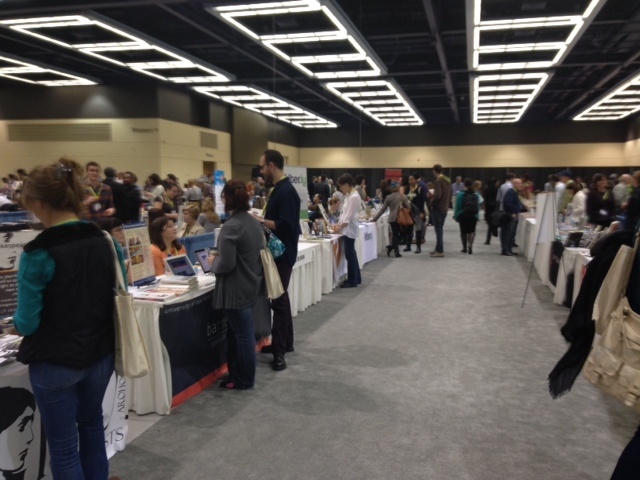 Combining my attendance at the 2014 Annual AWP Writers Conference and Bookfair held at the Washington State Convention Center with plans with the aforementioned Jason and Megan allowed me to enjoy business mixed with pleasure to the perfect percentage. The conference was massive – in addition to several gigantic rooms filled with booths and tables hosted by various publishers of all types of literary works, educational programs, and other writing-related companies, participants could attend hundreds of available lectures on all sorts of writing-related topics, like the relationship between editor and author, how social media has changed the way authors engage with readers, and how to write a good book review. My main incentive of attending was to meet other members of my Booktrope family. I was most excited to meet my book manager, Beth Bacon. With Beth on my team, I am able to devote my time to the aspects of writing and marketing that I enjoy the most (the actual writing and engaging with readers) and she helps me with all of the behind-the-scenes aspects of promotion and branding. It was a thrill to meet her face-to-face after so many telephone calls, emails and Google Hangouts. And I was also pleasantly surprised by the appearance of Loretta Matson, the talent behind all four of my book covers and even my website. Since I didn’t know Loretta would be there, I was beyond thrilled when she walked over to the Booktrope table right before my scheduled book signing. 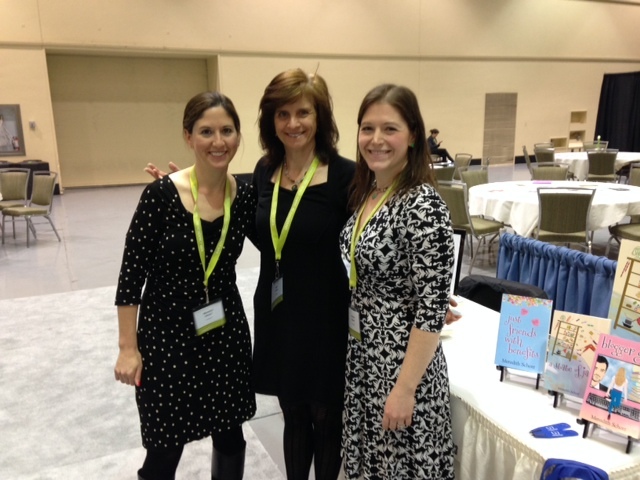 Both Beth and Loretta are integral members of my publishing team and I am so grateful for both of them. 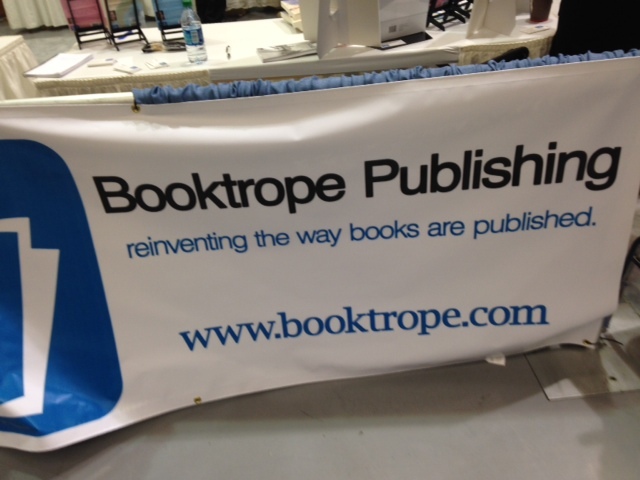 I also had the pleasure of meeting the two founders of Booktrope and several other book managers and authors. Everyone at Booktrope is so supportive and as I walked through the exhibit hall and spoke to other publishers, it felt so great to be exactly where I want to be. Of course, I’d like to sell about a million more books and have my books optioned for television or the big screen but I feel very blessed and content with the status of my writing career this very moment. My scheduled book signing was very exciting as it was the first time I ever did a signing by myself, however I went into it with very low expectations. The conference really was not the right venue for selling books as almost all of the attendees were writers or aspiring writers and most were more focused on nurturing their own careers. Most of the authors who did signings before me sold very few, if any books. 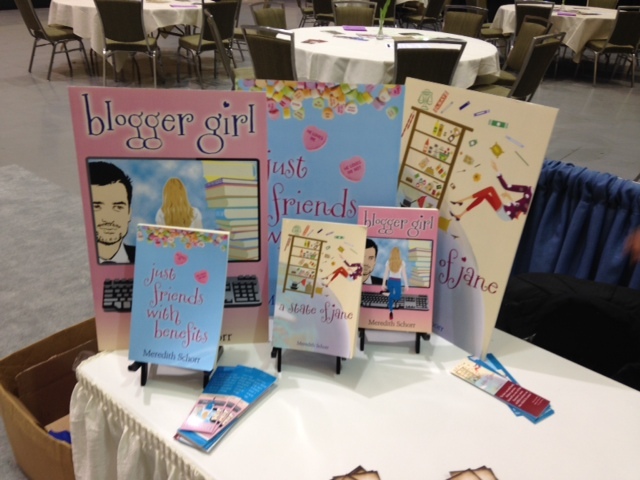 I had one person very interested in buying Blogger Girl, but we didn’t take credit cards and she had no cash. She promised to buy it on Kindle instead. While I only sold one paperback, I had a pretty good turnout at my table and several people took my bookmarks and said they would download copies on Amazon. Despite leaving with almost as many books as I had when I arrived, it was thrilling to interact with those who stopped by the table and proudly announce that I was the author of the three pretty pink, yellow and blue books on display. The entire business portion of the weekend was incredibly special and I had to pinch myself to be sure this was my life. I’m still at the beginning of my career and have a long way to go and a lot to learn, but I get to write —something I love more than anything else in the world—and I actually make money doing it. Not enough to quit my day job but that’s the goal I’m working towards. In the meantime, my wonderful colleagues at my day job (especially my boss/best friend Alan) make the wait a mostly pleasant one. Stay tuned for part two of this series where I will tell you all about how much food I ate during the “pleasure” portion of my trip. If you are from the Seattle area, I have recommendations for some great restaurants you need to try. And pictures too. It sounds (and looks) like an amazing time! You should be so proud! 😀 I am looking forward to the next post. Yay! I’m so glad the business portion went well! 🙂 I can’t wait to hear about part two. Whoah! Hero Jason (friend AND ex-boyfriend) who swooped in and used miles to purchase you a one-way ticket on Jet Blue?!?! Hello? How wonderful is THAT?! Can’t wait read part two! 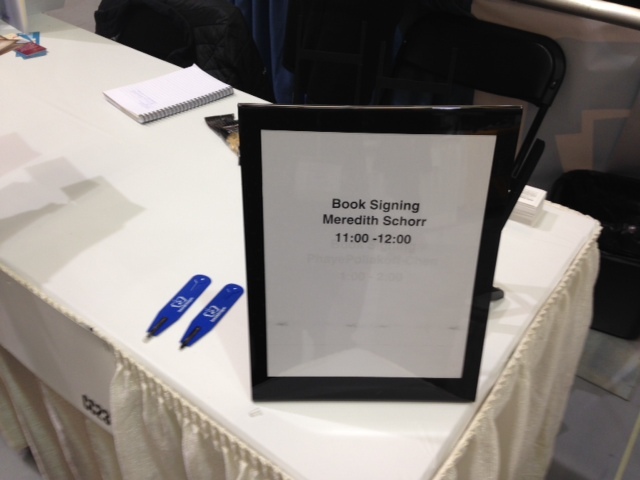 Meredith, thanks for posting about AWP. As a new Booktroper, I read about it online and considered going, but realized it probably didn’t make sense this year, as I live in the Boston area and Booktrope hasn’t yet published my book (Leaving the Beach) yet. With any luck, it’ll be out in April, and maybe I’ll make it out there next year. 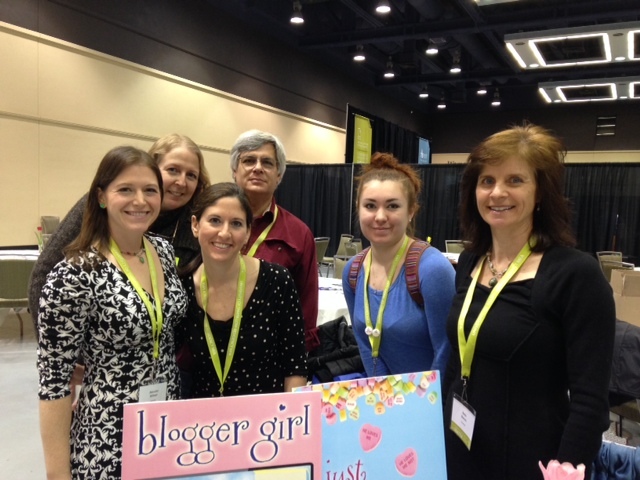 In the meantime, I look forward to reading Blogger Girl and your other books! I hope to meet you next year then! Good luck with Leaving the Beach. The title is intriguing and also kind of sad because, really, who ever wants to leave the beach? Thanks for commenting!! We will go next year, Ruth!